Luxury vinyl plank, or LVP, flooring is certainly the easiest flooring material to cut and may even be the easiest of all building materials to cut. All it takes is a sharp utility knife and, for most cuts, a straightedge. Cutting luxury vinyl actually involves more breaking than cutting: You use the utility knife to score the hard wear layer on the top surface of the flooring, then you simply bend back the material at the scored line to break it in half. It's that easy. This method is ideal for most straight cuts, but there are some tips and variations that help with making curves and other specialty cuts. Luxury Vinyl Flooring (LVF) is a very easy flooring material to work with. Crosscuts are cuts that make a plank shorter and are made perpendicular to its length. When cutting wood, crosscuts are said to go "against" the wood grain, and there are special considerations to prevent splintering the wood. But with vinyl flooring, there is no grain (even if the flooring looks like wood), so a crosscut is just like any other cut. What you do want to be concerned with is making the cuts straight. Straight cuts not only look better, but they also snap more cleanly and easily than sloppy, curving cuts. Be sure to use a construction-type, heavy-duty utility knife, not a "box cutter" or one of those flimsy plastic types with snap-off blades. It's a good idea to buy a package of replacement blades so your knife is always sharp. Making a crosscut with a speed square. Mark the cutting line with a fine-tip marker on the top (decorative) face of the flooring. Place the flooring on a flat work surface that you don't mind cutting into; you won't cut through the material, but the knife may score the surface after it leaves the plank. Position a square on the cutting line so that the edge of the square is registered against the top, long edge of the plank. Score the plank deeply, running the knife along the leg of the square. Pick up the plank, and bend it backward along the cutting line to snap it. If you find that you're not scoring deeply enough with one pass, press harder with the knife or make a second pass. Just be sure to follow the first scored line carefully to prevent a shabby edge. 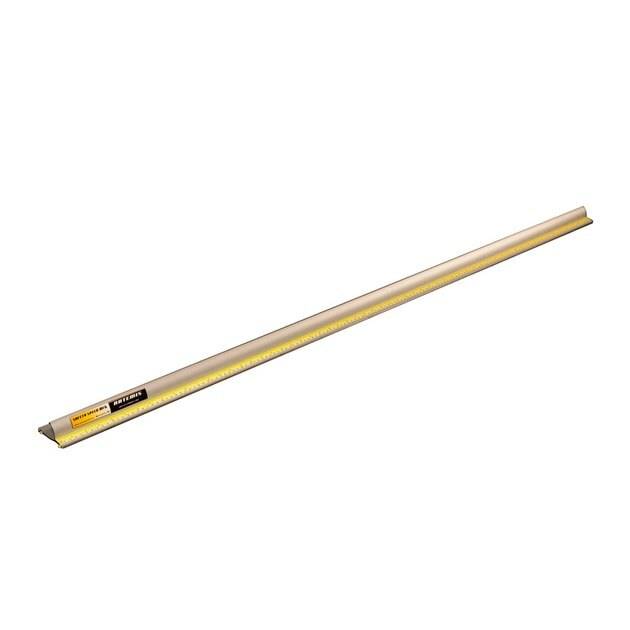 It also might help to hold the plank so the cutting line is at the edge of your work table or bench and snap the waste piece down over the edge. 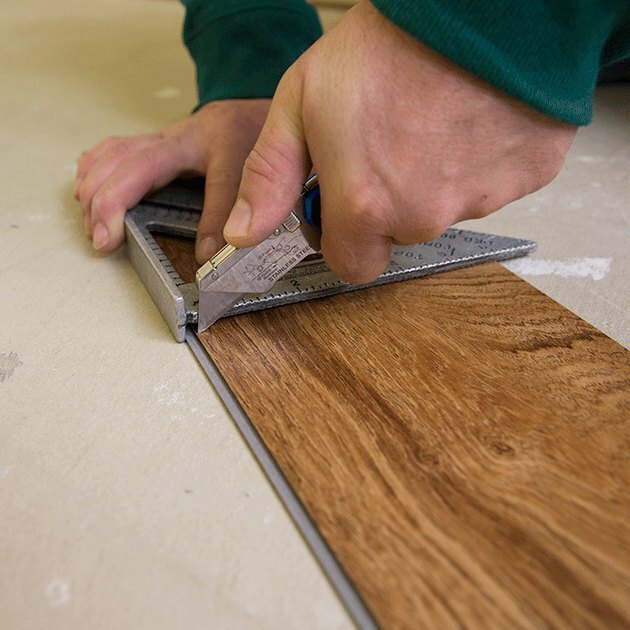 A metal straightedge works well for rip-cutting vinyl flooring planks. Rip cuts are just like crosscuts, but with a longer score line and a longer piece to break off. It's also a little harder to hold down the straightedge to keep it from moving throughout the long cut. If desired, you can secure the plank and straightedge with a couple of woodworking clamps. 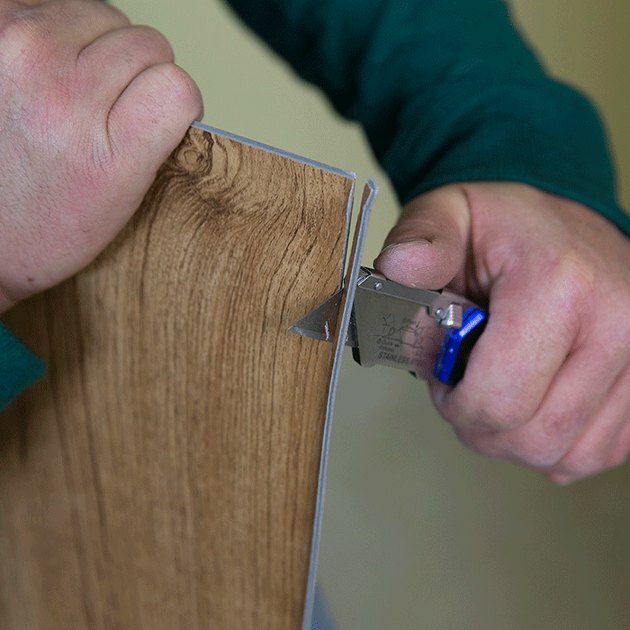 One long cut you might need to make that differs from a standard rip cut is when cutting off the groove from each plank in the first row against a wall. You can do this by simply holding the plank in one hand and paring away the two strips of the groove with the knife. Hold the knife blade at an angle so it cuts only the groove strips and is guided by the solid portion of the plank. 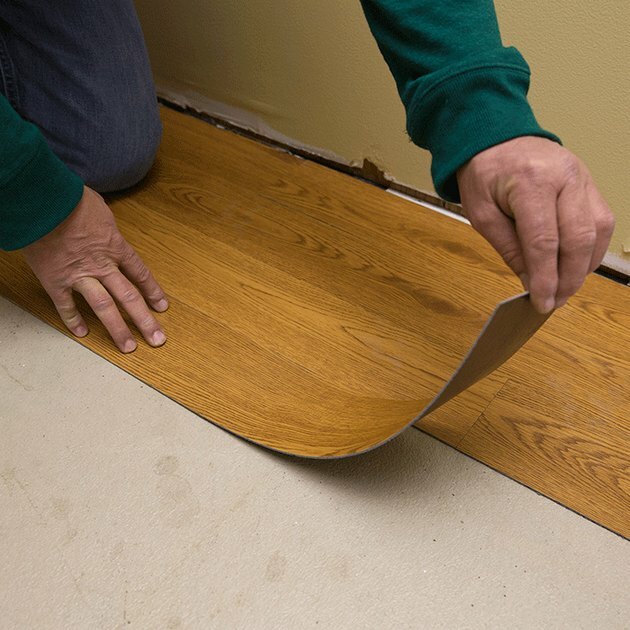 Use a utility knife to cut off the groove edge of a vinyl plank. Curves and notched cutouts aren't quite as simple as straight crosscuts and rip cuts because you're not breaking off the waste in one straight piece. To make a notch, you have to break the two end cuts (crosscuts) first, then break the single cut (rip cut) at the bottom of the notch. To make curved cuts, you can use a utility knife and score the cutting line freehand, without a straightedge or square. You can also use aviation snips, which are all-purpose tin snips with pointed jaws that make detailed cuts better than the long, scissor-like jaws of traditional tin snips. The advantage to using aviation snips is that you don't have to snap the material, which can be difficult with tight curves and holes. If you're using the score-and-snap method for tight curves, it can help to snap the plank with a pair of pliers.